As the season winds down, saavy gardeners are planning for next year's garden glory. Spring is a special time, when the earth bursts into bloom and beckons us with vivid flowers after the harshness of winter. Bulbs are a great landscape design option used to highlight house features and specimen shrubs. Contact us for the complete listing of available options! Please indicate desired bulb type. Please indicate desired planting area. Unsure? We're happy to make a recommendation for maximum impact. Thank you for your order! Custom quotes include recommended quantities, labor and materials based on size of planting area and bulb variety. Bulb planting is done in November. We will provide a custom estimate within 48 hours of your request. Questions? Call us at 877-933-GROW. Vivid poppy red for the color purist. A vigorous tulip of great substance and radiant color that is sure to attract attention from a distance. Looks great against light colored houses. 20" H. Mid season bloomer. An exotic beauty with vase-shaped blooms composed of narrow, wavy petals. They are vibrant pink, with lighter tones, and have a green stripe down the middle. A terrific cut flower. 24" H, Late season bloomer. Petals are a light greenish yellow, the trumpet creamy white with a soft yellow rim. In gentle morning or evening light, the flowers glow. Returning reliably each year. Deer resistant. 16" H, Early-Mid season bloomer. Satiny deep purple flowers. 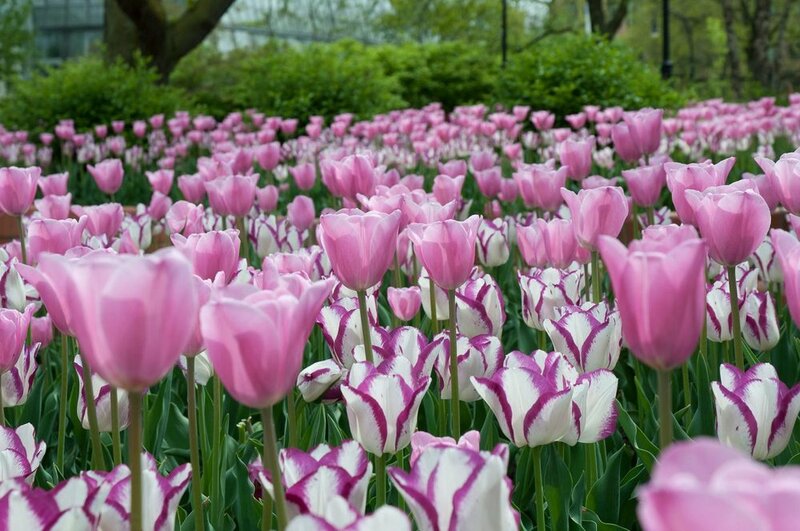 A sturdy and dependable garden tulip that's clearly the best solid purple around. Combines wonderfully with lighter-colored tulips. 18" H. Mid Season bloomer. A cool and companionable pair: a white edged and speckled with purple and a lovely soft pink. Easy on the eye and yet very showy. Stunning clustered among perennials. 22" H, Late season bloomer. Timeless. Elegant. Broad, pure white petals, laid neatly three over three, form flat, round flowers. In the center is a dainty, pale yellow cup. "Exquisite" says it all. Deer resistant. 14" H, Mid season bloomer. Decidedly uncommon and not for the faint of heart. 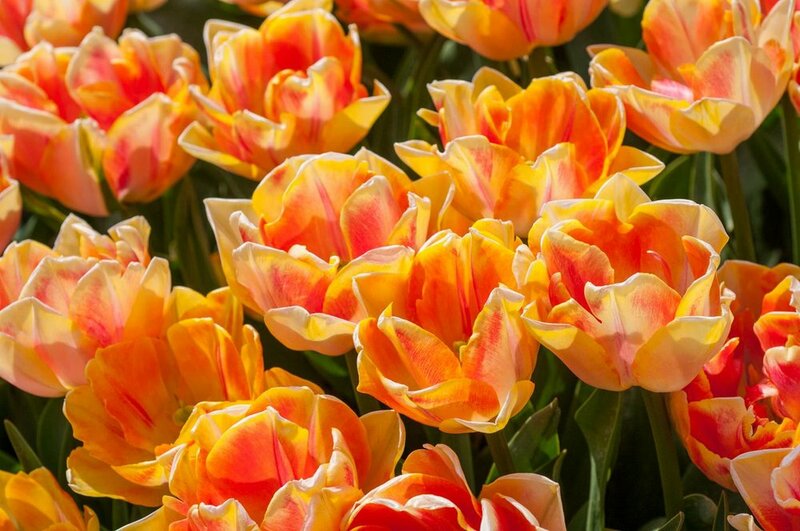 Distinguish your garden with this tulip combining butter yellow and apricot in a way a painter would admire and presents them in a form a sculptor might imitate. An unsung bloomer that deserves to be better known. It pushes its blue-lined, milk white flowers through fallen leaves. A woodland bulb that can come back for many years. 5" H, Very early bloomer. A blend of tough, dependable daffodils, one gold, one white with a yellow cup that turns ivory. Given 1/2 day of sun, the bulbs often increase. Deer resistant. 16" H, Early season bloomer.